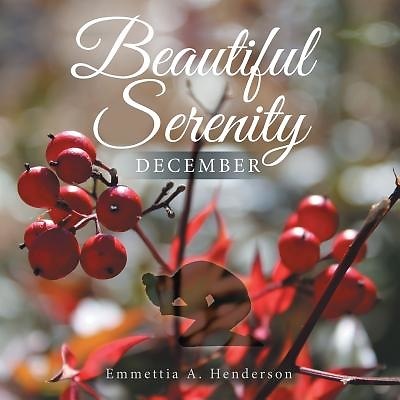 The second month within the Beautiful Serenity series has finally arrived--Beautiful Serenity the December edition Beautiful Serenity will inspire and encourage you This book will empower you using simple but soul stirring images and spirit filled words from God. The scriptures in this book come directly from the Bible, along with spirit-led narration. The beautiful images will return your soul to that innocent desire where you appreciate the simple gifts from God that surround you. Beautiful Serenity will lead you on an introspective journey as you live through the day-by-day challenges of life. It is designed with a very special space just for you to journal. Yes, journaling is proven to be a therapeutic tool that helps us to cope with the challenging times in our lives. There is a special place for you to write down your thoughts, draw, vent, etc., while spending time reading the Word of God in this book. In my personal experience while reading Beautiful Serenity, I found it was a time when God spoke, and he gave a revelation as I read the pages of this book. I assure you, God will provide a time of beautiful serenity. God said in Psalms 46:10, "be still and know that I am God." Thus, I believe this book, Beautiful Serenity, will allow you to look for and find stillness and peace. It is where you can receive revelation from God while spending time with God. Find peace, receive revelation, and be blessed as the images inspire you, the scriptures empower you, and journaling changes you inside the pages of Beautiful Serenity.